In Part Two we covered quite a bit of ground. 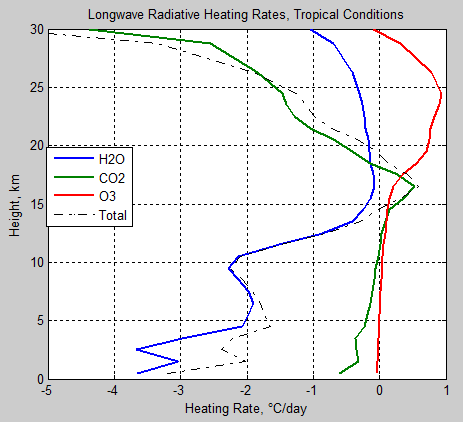 At the end we looked at the first calculation of heating rates. The values calculated were a little different in magnitude from results in a textbook, but the model was still in a rudimentary phase. After numerous improvements – outlined in Part Five – The Code, I got around to adding some “standard atmospheres” so we can see some comparisons and at least see where this model departs from other more accurate models. If the only part of climate physics that was actually working was “longwave radiation” (terrestrial radiation) then how fast would different parts of the atmosphere heat up or cool down? As we will see this mechanism (terrestrial radiation) mostly results in a net cooling for each part of the atmosphere. The atmosphere also absorbs solar radiation – not shown in these graphs – which acts in the opposite direction and provides a heating. Lastly, the sun warms the surface and convection transfers heat much more efficiently from the surface to the lower atmosphere – and this makes up the balance. 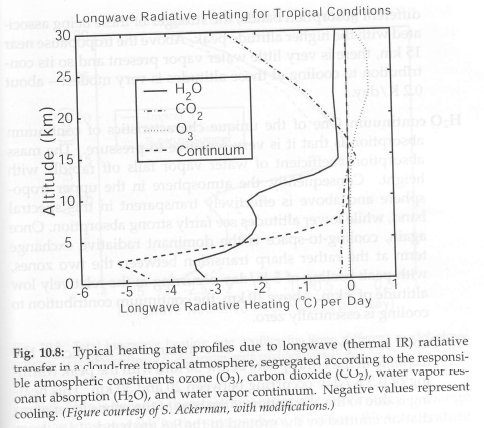 So, with longwave heating (cooling) curves, we are consider one mechanism of how heat is transferred. Second, what is “longwave radiation”? This is a conventional description of the radiation emitted by the climate system, specifically the fact that its wavelength is almost all above 4 μm. The other significant radiation component in the climate system is “shortwave radiation”, which by convention means radiation below 4 μm. See The Sun and Max Planck Agree – Part Two for more. Third, what is a “standard atmosphere”? It’s just a kind of average, useful for inter-comparisons, and for evaluation of various climate mechanisms around ideal cases. In this case, I used the AFGL (air force geophysics lab) models which are also used in the LBLTRM (line by line radiative transfer model). Notice that the heating rate is mostly negative, so the atmosphere is cooling via radiation – which means for this atmospheric profile water vapor, CO2 and ozone have a net effect of emitting more terrestrial radiation out than they absorb via these gases. 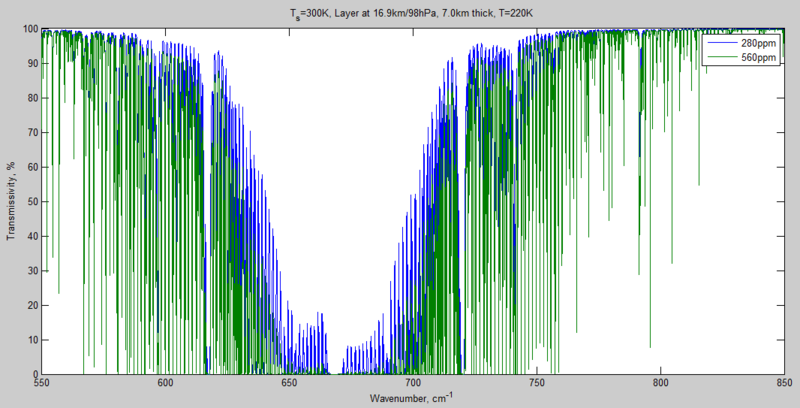 So we can see that the MATLAB model created here from first principles and using the HITRAN database of absorption and emission lines is quite close to other calculated standards. 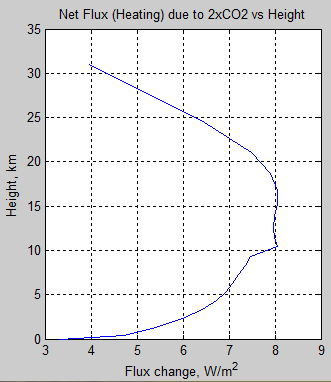 In fact, the differences are small except in the mid-stratosphere and we may find that this is due to slight differences in the model atmosphere used, or as a result of not using the Voigt profile (this is an important but technical area of atmospheric radiation – line shapes and how they change with pressure and temperature in the atmosphere – see for example Part Eight – CO2 Under Pressure). Pekka Pirilä has been running this MATLAB model as well, has helped with numerous improvements and has just implemented the Voigt profile so we will shortly find out if the line shape is a contributor to any differences. The data used to create these graphs comes from the HITRAN database. Understanding atmospheric radiation is not so simple. But now we have a line by line model of absorption and emission of radiation in the atmosphere we can do some “experiments”. See Part Two and Part Five – The Code. Many people think that models are some kind of sham and climate scientists should be out there doing real experiments. Well, models aren’t a sham and climate scientist are out there doing lots of experiments. Various articles on Science of Doom have outlined some of the very detailed experiments that have been done by atmospheric physicists, aka climate scientists. When you want to understand why some aspect of a climate mechanism works the way it does, or what happens if something changes then usually you have to resort to a mathematical model of that part of the climate. You can’t suddenly increase the amount of a major GHG across the planet, or slow down the planetary rotation to ½ its normal speed. Well, not without a sizable investment, a health and safety risk, possible inconvenience to a lot of people and, at some stage, awkward government investigations. You can’t stop the atmosphere emitting radiation or test a stratosphere that gets cooler with height. But you can attempt to model it. Mathematical models all have their limitations. We have to understand what the model can tell us and what it can’t tell us. We have to understand what presuppositions are built into the model and what can change in real life that is not being modeled in the maths. It’s all about context. (Well-designed) models are not correct and are not incorrect. They are informative if we understand their limitations and capabilities. In contrast to mathematical models built around the physics of climate mechanisms, many people commenting in the blog world (or even writing blogs) have a vague mental model of how climate works. This of course is way way ahead of a climate model built on physics. It has the advantage of not being written down in equations so that no one can challenge it and seemingly plausible hand-waving argument 1 can be traded against hand-waving argument 2. Unfortunately, on this blog we don’t have the luxury of those resources and – where experiments are not available or not possible – we will have to evaluate the results of mathematical models built on physics and observations. All the above is not an endorsement of what GCMs tell us. And not an indictment. Hopefully no one reading the above paragraphs came to either conclusion. When I first built the line by line model it had more limitations than today. One early problem was the stratosphere. In real life the temperature of the stratosphere increases with height. 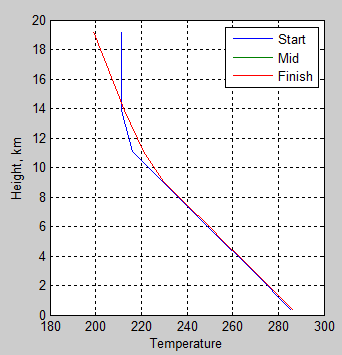 In the model the temperature decreased with height. This was expected. O2 and O3 absorb solar radiation (primarily ultraviolet) and warm mainly the middle layers of the stratosphere. But the model didn’t have this physics. The model, at this stage, primarily modeled the absorption and emission of terrestrial (aka ‘longwave’) radiation by the atmosphere. So, after a few versions a very crude model of solar absorption was added. Unfortunately, this solar absorption model still did not create a stratosphere that increased with temperature. This was quite disappointing. Then commenter Uli pointed out that the model had too much stratospheric water vapor and I added a new parameter to the model which allowed stratospheric water vapor to be set differently from the free troposphere. (So far I’ve been using a realistic level of 6ppmv). At the same time, I’ve been updating the model so that it can run to some kind of equilbrium and then various GHGs can be changed. This was to calculate “radiative forcing” under various scenarios, and specifically I wanted to show how energy moved around in the climate system after a “bump” in something like CO2. This is something that many many people can’t get right in their heads. One of the objectives of the model is to show bit by bit how the increased CO2 causes a reduction in net outgoing radiation, and how that in turn pushes up the atmospheric and surface temperature. On this journey, once the model stratosphere was behaving a little like its real-life big brother it occurred to me that maybe we could answer the question of why the stratosphere was expected to cool with increased CO2. See Stratospheric Cooling for some background. Previously I have worked under the assumption that there are lots of competing “terms” in the energy balance equation for how the stratosphere responds to more CO2 and so simple conceptual models are not going to help. Now the Science of Doom Climate Model (SoDCM) comes to the rescue. In fact, while I was waiting for lots of simulations to finish on the PC I was reading again the fascinating Radiative Forcing and Climate Response, by Hansen, Sato & Ruedy, JGR (1997) – free paper – and in a groundhog day experience realized I didn’t understand their flux graphs resulting from various GCM simulations. So the SoDCM allowed me to solve my own conceptual problems. Let’s take a look at stratospheric cooling. The equilibrium was reached by running the model for 500 (model) days, with timesteps of 2 hours. The ocean depth was only 5 meters simply to allow the model to get to equilibrium quicker (note 1). Then at 500 days the CO2 concentration was doubled to 560 ppm and we capture a number of different values from the timestep before the increase and the timestep after the increase. 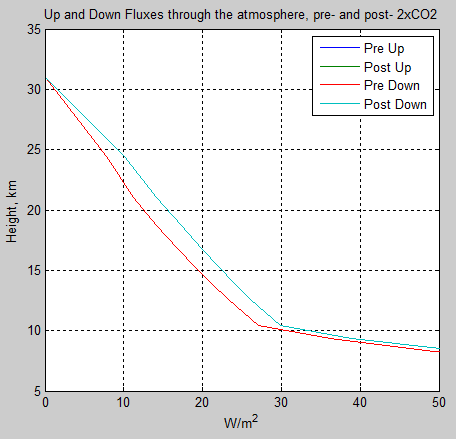 If flux just stays constant (vertical line) through a section of the atmosphere what does it mean? It means there is no net absorption. It could mean that the atmosphere is transparent to that radiation. It could mean that the atmosphere emits exactly the same amount that it absorbs. Or some of both. Either way, no change = no net radiation absorbed. Take a look in figure 3 at the (pre-CO2 doubling) upward flux above 10km (in the stratosphere). About 237 W/m² enters the bottom of the stratosphere and about 242 W/m² leaves the top of atmosphere. So the stratosphere is 5 W/m² worse off and from the first law of thermodynamics this either cools the stratosphere or something else is supplying this energy. Now take a look at the (pre-CO2) downward flux in the stratosphere. At the top of atmosphere there is no downward longwave radiation because there is no source of this radiation outside of the atmosphere. 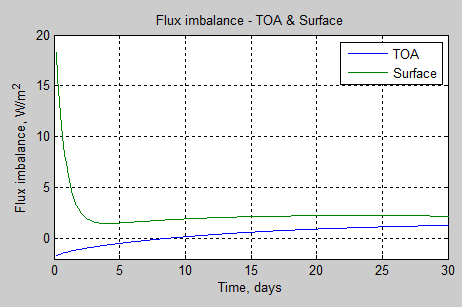 So downward flux = 0 at TOA. At the bottom of the stratosphere, about 27 W/m² is leaving. So zero is entering and 27 W/m² is leaving – this means that the stratosphere is worse off by 27 W/m². If we add up the upward and downward longwave fluxes through the stratosphere we find that there is a net loss of about 32 W/m². This means that if the stratosphere is in equilibrium some other source must be supplying 32 W/m². In this case it is the solar absorption of radiation. If we were considering the troposphere it would most likely be convection from the surface or lower atmosphere that would be balancing any net radiation loss from higher up in the troposphere. The upward radiation is reducing with height – energy is absorbed by each level of the atmosphere. This is a net heating. The downward radiation is increasing – energy is lost from each level of the atmosphere. This is a net cooling. The slope of the curves is not equal. This is because energy is transferred via convection in the troposphere. Understanding these concepts is essential to understanding radiation in the atmosphere. Let’s take a closer look at the upward and downward changes due to doubling CO2. So the “pre” curve is the atmosphere in a nice equilibrium condition. And the “post” curve is immediately after CO2 has been doubled, long before any equilibrium has been reached. Even though the curves are roughly parallel from 10km through to 30km you should be able to see that there is a larger gradient on the post-2xCO2 curve. So pre-CO2 increase, the stratosphere loses a net upward of about 5 W/m², and after CO2 increase the stratosphere loses a net upward of about 6 W/m². 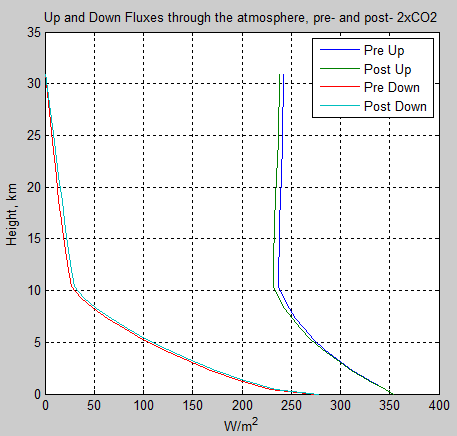 This means more CO2 increases the cooling of the stratosphere when we consider the upward flux. So now the question is, WHY? If we want to understand the answer, the most useful ingredient is to look at the spectral characteristics of pre- and post. Here we take the radiation leaving at TOA and subtract the radiation entering at the tropopause. So we are considering the net energy lost (why lost? because this calculation is energy out – energy in), and as a function of wavenumber. So we see that in the case of post-2xCO2, the energy lost is a little higher, and it is in the wavenumber region where CO2 emits strongly. CO2’s peak absorption/emission is at 667 cm-1 (15 μm). We can see that the main regions of CO2 absorption and emission are the reason. And we note that the temperature of the stratosphere is increasing with height. So the reason is clear – due to principles outlined earlier in Part Two. Because the stratospheric temperature increases with height, the net emission (i.e., emission less absorption) of radiation, as we go up through the stratosphere will be a progressively higher value. And once we increase the amount of CO2, this net emission will increase even further. This is what we see in the spectral intensity – the net change in stratospheric emission [(out-in)2xCO2 – (out-in)1xCO2] increases due to the emission in the main CO2 bands. Of course, as already mentioned, the downward longwave flux at TOA must be zero. This time it is conceptually easier to understand the change from more CO2. There’s one little fly in the understanding ointment, but let’s come to that later. 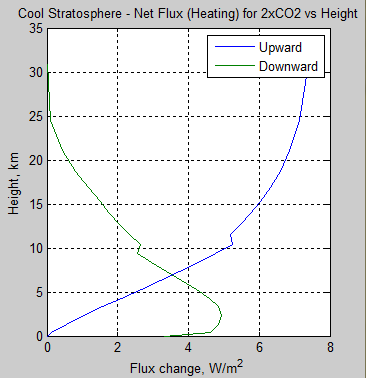 So when we think about the cooling of the stratosphere from downward flux it’s quite easy. Coming in at the top is zero. Coming out of the bottom (pre-CO2 increase) is about 27 W/m². Coming out of the bottom (post-2xCO2) is about 30 W/m². 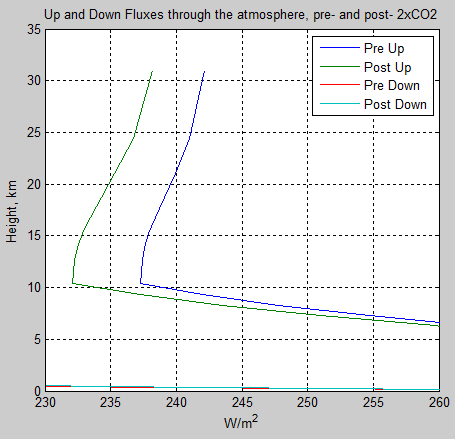 So increasing CO2 causes a cooling of about 3 W/m² due to changes in downward flux. And as with figure 7, below is the difference in downward intensity as a result of 2xCO2. This is post less pre, so the positive value overall means a cooling – as we saw in the total flux change in figure 8. The temperature is reducing as we go downwards so the emission from the center of the CO2 band cannot be increasing as we go downward. If we look back at figure 7 for the upward direction, the temperature is increasing upward so the emission from the center of the CO2 band must be increasing. And the conceptual fly in the ointment alluded to earlier – this one can be confusing (or simple..) – if the starting flux at TOA is zero and the temperature decreases downward surely the downward flux only gets less? Less than zero? Instead, think of the whole stratosphere as a body. It must emit radiation due to its temperature and emissivity. It can’t absorb any radiation from above (because there is none), so it must emit some downward radiation. As its emissivity increases with more GHGs it must emit more radiation into the troposphere. It’s simple really. 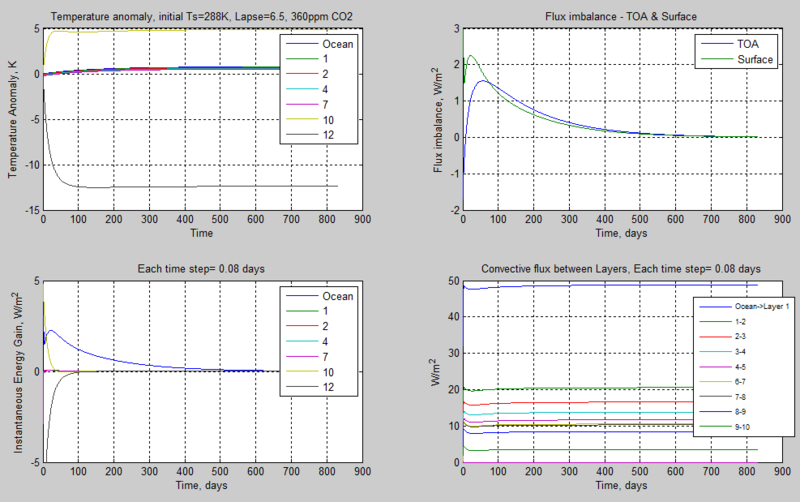 Let’s now finalize this story by considering the net change in flux with height due to CO2 increases. Here if “net” is increasing with height it means absorption or heating. And if “net” is reducing with height it means emission or cooling. See note 2 where the details are explained. 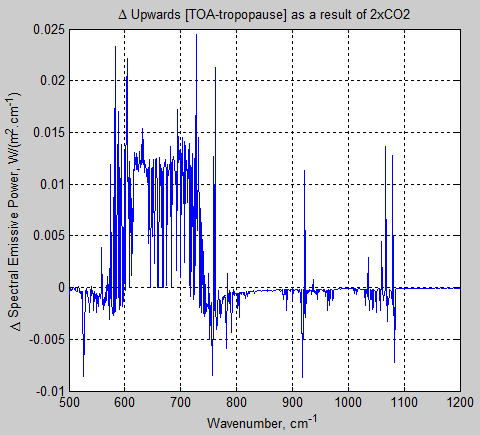 From the tropopause at 11km through to TOA we can see that the combined change in flux due to CO2 doubling causes a cooling of the stratosphere. 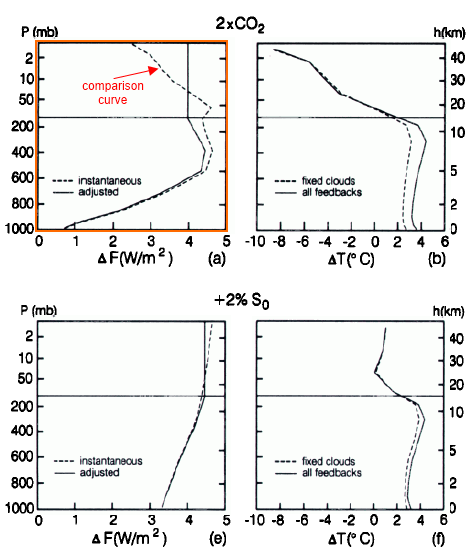 (And from the surface up to the tropopause we see a heating of the troposphere). 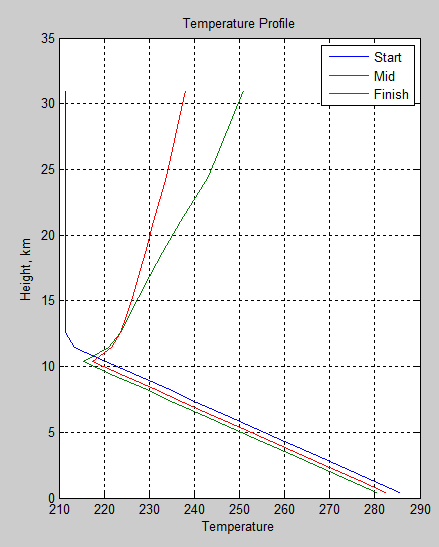 The highlighted instantaneous graph is the one for comparison with figure 12. This is the case before the stratosphere has relaxed into equilibrium. Note that the “adjusted” graph – stratospheric equilibrium – has a vertical line for ΔF vs height, which simply means that the stratosphere is, in that case, in radiative equilibrium. Notice as well that the magnitude of my graph is a lot higher. There may be a lot of reasons for that, including that fact that mine is one specific case rather than some climatic mean, and also that the absorption of solar radiation in my model has been treated very crudely. (Lots of other factors include missing GHGs like CH4, N2O, etc). So we have seen that the net emission of radiation by CO2 bands is what causes the cooling from upward radiation and the cooling from downward radiation when CO2 is increased. 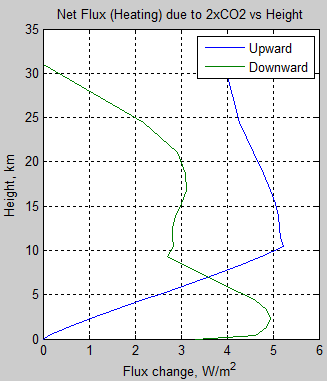 We can see that the downward flux change is similar to figure 11, but the upward flux is different. It is fairly constant through the stratosphere. This is not surprising. The flux from below is either transmitted straight through, or is absorbed and re-emitted at the same temperature. So no change to upward flux. But the downward flux only results from the emission from the stratosphere (nothing transmitted through from above). As CO2 is increased the emissivity of the atmosphere increases and so emission of radiation from the stratosphere increases. The fact that the stratospheric temperature is isothermal has a small effect as can be seen by comparing the green curve on figures 15 & 11. But it isn’t very significant. 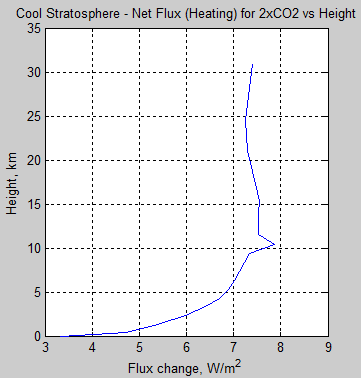 Here we see that the effect of increased CO2 on the upward flux is now a heating in the stratosphere. And the net change in downward flux still has a cooling effect. 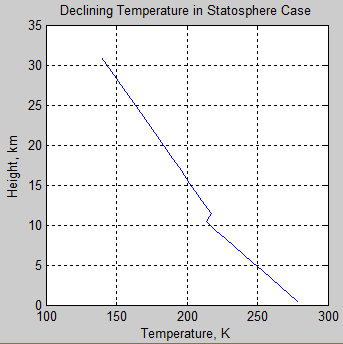 Here we see that for a stratosphere where temperature reduces with altitude, doubling CO2 would not have a noticeable effect on the stratospheric temperature. Depending on the temperature profile (and other factors) there might be a slight cooling or a slight heating. This is a subject where it’s easy to confuse readers – along with the article writer. Possibly no one that was unclear before made it the whole way and said “ok, got it”. Hopefully, if you only made it only part of the way through, you now have a better grasp of some of the principles. The reasons behind stratospheric cooling due to increased GHGs have been difficult to explain even for very knowledgeable atmospheric physicists (e.g., one of many). I think I can explain stratospheric cooling under increasing CO2. I think I can see that other factors like the exact temperature profile of the stratosphere on any given day/month and the water vapor profile (not shown in this article) will also affect the change in stratospheric temperature from increasing CO2. If the bewildering complexity of up/down, in-out, net of in-out, net of in-out for 2xCO2-original CO2 has left you baffled please feel free to ask questions. This is not an easy topic. I was baffled. I have 4 pages of notes with little graphs and have rewritten the equations in note 2 at least 5 times to try and get the meaning clear – and am still expecting someone to point out a sign error. Part Twelve – Heating Rates – heating rate (‘C/day) for various levels in the atmosphere – especially useful for comparisons with other models. Note 1: The relative heat capacity of the ocean vs the atmosphere has a huge impact on the climate dynamics. 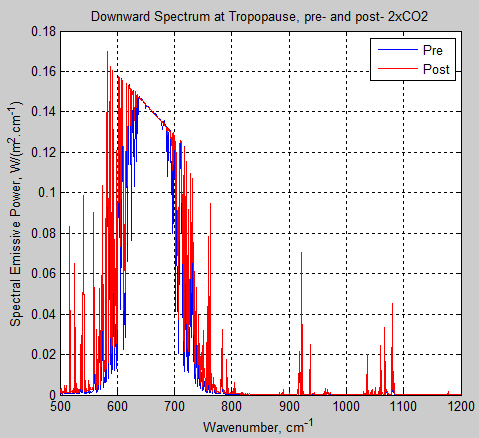 But in this simulation we were interested in reaching an equilibrium for a given CO2 concentration & solar absorption – and then seeing what happened to radiative balance immediately after a bump in CO2 concentration. For this requirement it isn’t so important to have the right ocean depth needed for decent dynamic modeling. Note 2: The treatment of upward and downward flux can get bewildering. The easiest approach is to just consider the change in flux in the direction in which it is travelling. But because upward and downward are in opposite directions, F↑ is in the direction of z, and F↓ is in the opposite direction to z, so heating and cooling are in opposite directions. We have mostly looked at the upward spectra at the top of atmosphere (TOA) as various conditions are changed. There’s a good reason for this focus – the outgoing longwave radiation (OLR) determines how much the climate system cools to space. Over a given timescale this either matches absorbed solar radiation or the planet is heating or cooling. So it is changes in OLR (or absorbed solar) that really affect the heat balance in the climate. By comparison, the trend in downward longwave radiation (DLR) at the surface is more a result of overall planetary heating and cooling. But of course, the climate is a lot more complex than indicated by that last statement. Let’s take a look. 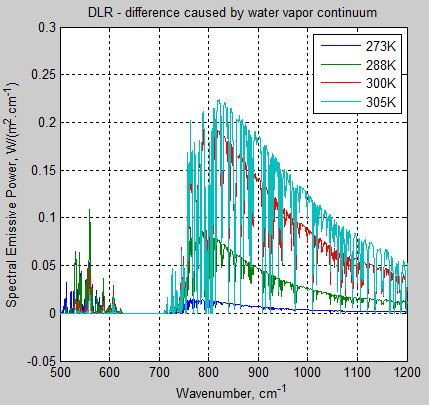 Note that Part Four – Water Vapor already has some graphs of how the DLR or “back radiation” changes with water vapor concentration. 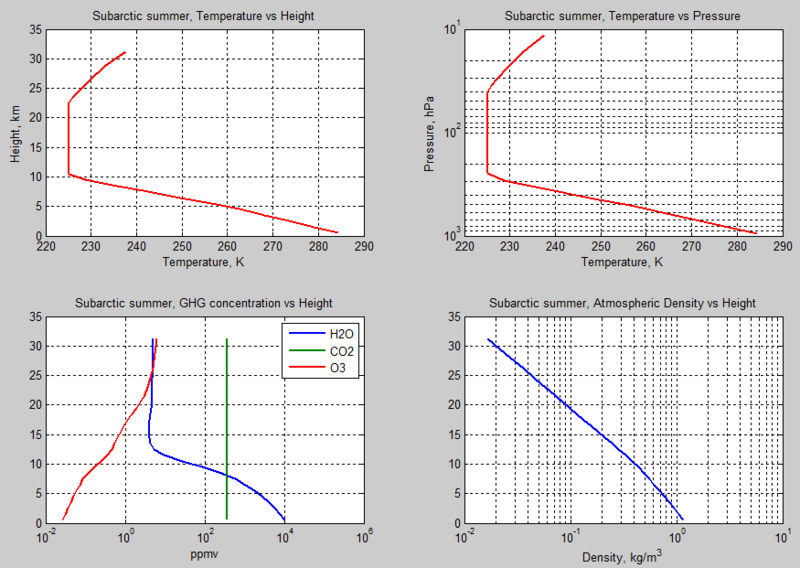 Here is the DLR for 4 different surface temperatures. In each case there is a lapse rate of 6.5 K/km, the boundary layer humidity (BLH) = 100%, the free tropospheric humidity (FTH) = 40% and there were 10 atmospheric layers in the model with a top of atmosphere at 50 hPa. More about the model in Part Two and Part Five – The Code. The continuum operates over the whole range of terrestrial wavelengths of interest, but its main impact is in the “atmospheric window region” between 800-1200 cm-1. This window region doesn’t have many strong absorption lines so absorption from any other cause has a big effect. Notice that the 273 K (0 °C) condition is almost unaffected by the continuum. This is because the effect is dependent on the amount of water vapor squared. And the amount of water vapor is strongly dependent on temperature. This shows that once we are above a surface temperature of 300 K (27 °C) with high boundary layer humidity the radiation from atmosphere to surface is getting close to blackbody emission. The graph also demonstrates that most of that change is due to the continuum. These were all with CO2 at 360ppm (and N2O at 319 ppbv, CH4 at 1775 ppbv and no ozone). Let’s look at how changing CO2 concentration affects these results. This is a very important graph – what does it show? 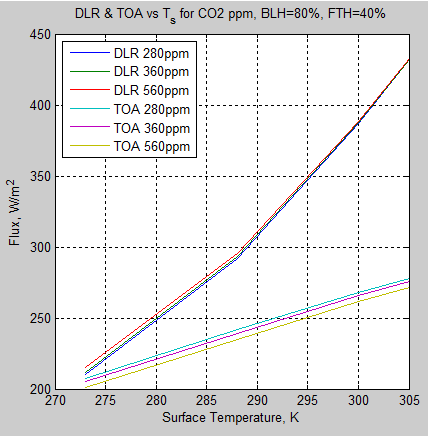 This shows clearly how the change in atmospheric DLR due to doubling CO2 is very much a function of surface temperature. 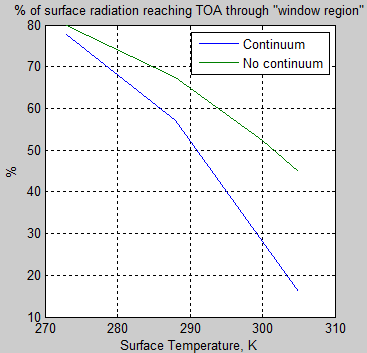 And at the same time, the change in TOA radiation (“OLR”) is almost independent of surface temperature. From the information presented in this article on how DLR is affected by water vapor at high temperatures the first point shouldn’t be surprising. And from the explanation in Part Four – Water Vapor both points shouldn’t be surprising. The surface energy balance is very important for determining the dynamics of surface heat transfer, including initiating convection. As the temperature gets up to 30°C the ability of the surface to radiate to space is reduced to a very low value. “Deep convection” which drives the tropical circulation is mostly initiated in these very hot surface conditions. 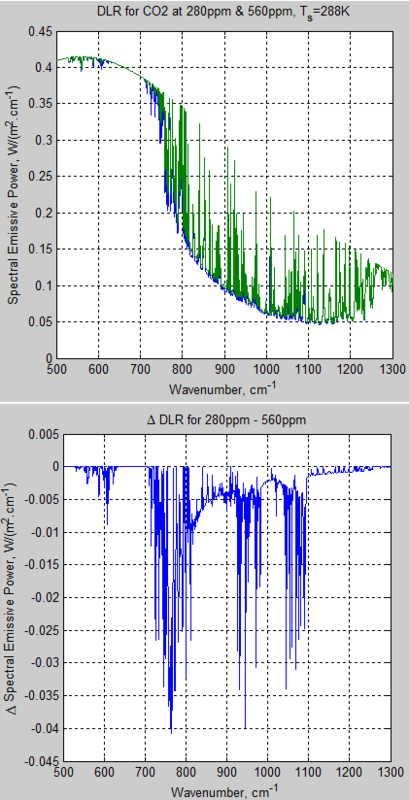 The effect of changing CO2 on atmospheric radiation to the surface (DLR) is small. With high boundary layer relative humidity, water vapor masks out most of the effect of changing CO2 in hotter surface conditions. 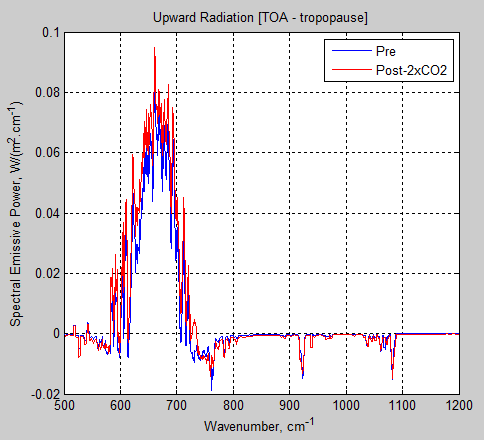 But the effect of increasing CO2 on the TOA radiation balance is completely different. High surface humidities have little or no effect on this TOA balance. 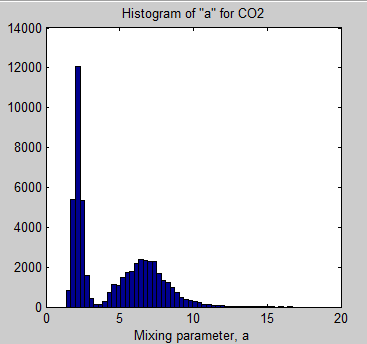 And there, doubling CO2 has a significant impact (all other things being equal) as shown in figure 12 of Part Seven – CO2 increases. Working out radiation balance through the atmosphere in your head is difficult. Most people attempting it don’t have the right “calibration points”. Note 1: This model looks at the range of wavenumbers 200-2,500 cm-1, which equates to 4-50μm, to ease up the calculation effort required. This means that when we sum up the contribution from all calculated wavelengths we are missing some bits. 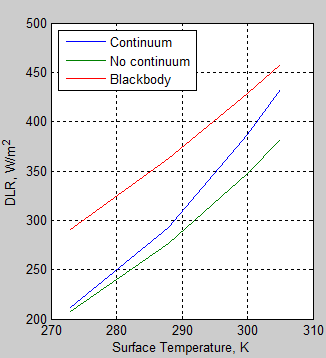 So for example, if we calculate the emission of thermal radiation by a surface at 288K with an emissivity of 1.0 we calculate 390 W/m² – the “blackbody flux”. But with our “restricted view” of the spectrum we will instead calculate 376 W/m². Almost all of the “missing spectrum” is in the far infra-red (longer wavelengths/lower wavenumbers), and is subject to relatively high absorption from water vapor. In the series so far we have seen how radiation interacts with the atmosphere for a given surface/atmospheric condition. what is the outgoing radiation, OLR, at the top of the atmosphere (TOA)? what is the surface downward radiation, DLR? what do the spectra look like and why? how do surface temperatures, water vapor concentrations and CO2 concentrations change these values? These are all important questions, and the necessary first step. Because if we don’t understand these points then it is impossible to work out how the atmosphere reaches a steady state under those conditions, and of course, impossible to work out how a new steady state will be reached if something changes. The atmospheric model is described in brief in Part Two and in a comment, then in detail in Part Five – The Code. The earlier model had some ability to step forward in time and calculate temperature change (but with many limitations and some flaws). Specifically I wanted to be able to track the change of energy in each layer and also account for convective heat flow. All what you’re saying would show is *if* the surface temperature were to increase by 1.1C (independent of mechanism) it would restore radiative balance for both +3.7 W/m^2 of post albedo solar power and +3.7 W/m^2 of GHG absorption (which I agree with). In no way does this prove or demonstrate that +1.1C at the surface (for no feedback) is itself a requirement to restore balance at the TOA from +3.7 W/m^2 of GHG absorption. This is because you’ve made no accounting for cause and effect – you’ve only shown that the outcome of one potential effect (i.e. +1.1C at the surface) would restore balance at the TOA. This is an interesting question, and this kind of question is part of the reason for this series. Let’s first look at the simple question of how any steady state is reached. I add more specifics about the model (v.0.10.1) at the end of the article and have added the code to Part Five – The Code. This is shown in °C/day but is easily converted to W/m² by dividing by 86,400 (number of seconds in a day) and multiplying by the heat capacity of that layer of the atmosphere. 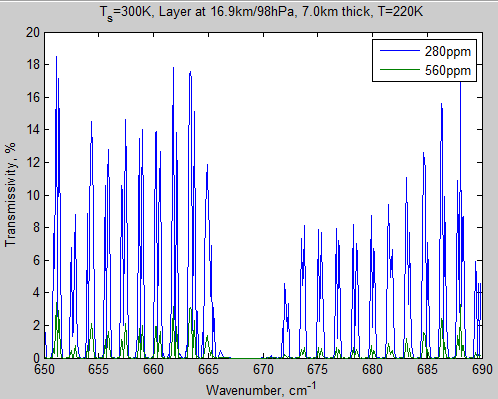 Each of the atmospheric layers in the model have roughly the same number of molecules so the graph of W/m² absorbed in a given layer looks quite similar in shape. I introduced this solar heating partly because the old model had bad accounting at the top of atmosphere, where solar absorption just (magically) kept the stratosphere isothermal (the same temperature). That constraint is now gone in this update of the model. The starting point for this model was an ocean temperature of 288K and a lapse rate of 6.5 K/km, up to a tropopause of 200 hPa with an isothermal stratosphere. The solar radiation absorbed by the climate was 242 W/m², with about 100 W/m² absorbed in the atmosphere and the balance absorbed by the surface. Each time step was 2 hours, and the model was run for 800 days (10,000 time steps). Why is the model out of balance to begin with? There’s no reason it should be in balance. 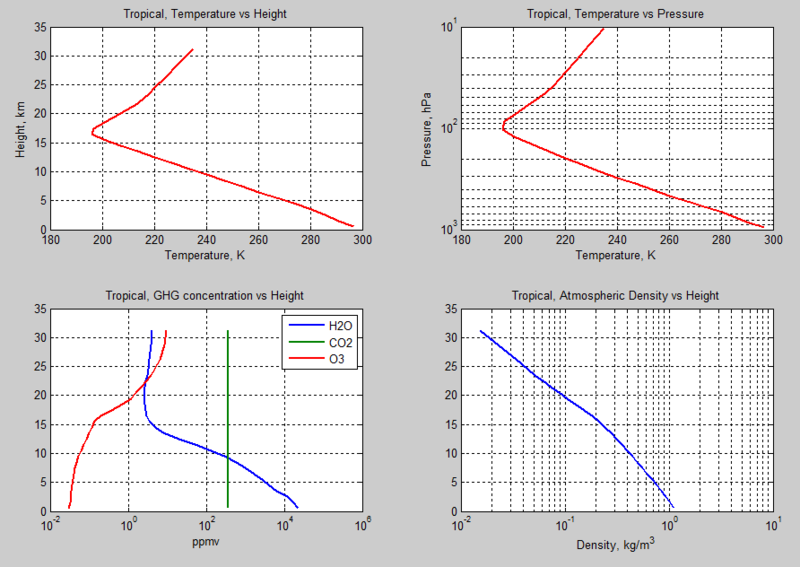 I’ve simply prescribed a surface temperature and an atmospheric temperature profile and humidity and CO2 concentration. Why should that happen to be the steady state condition for the solar absorbed radiation of 242 W/m² with 100 W/m² absorbed in the atmosphere? So the model works by energy accounting in each time step for each layer in the model. Energy cannot be created or destroyed. 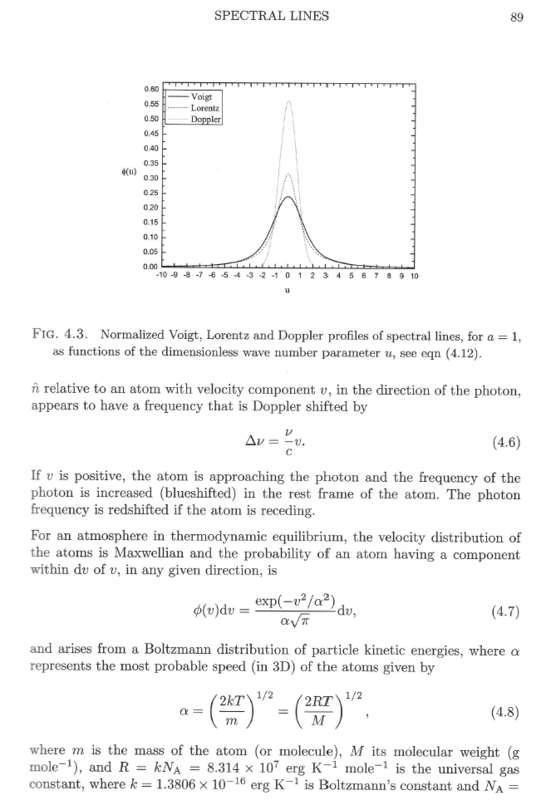 Radiation emitted and absorbed is calculated by the relevant equations (already explained). Convection moves heat if the atmosphere above is too cold (see Potential Temperature and Density, Stability and Motion in Fluids). Energy retained increases the temperature of the layer. Energy lost reduces the temperature of the layer. 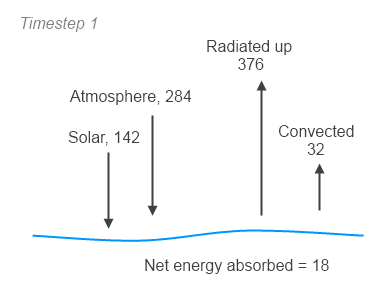 The net is 18 W/m² and so the “ocean” absorbs this energy which means it heats up. In 2 hours (one timestep) this comes to 129 kJ/m² and as the “ocean” in this model is just 10m deep (to allow quicker progress to any equilibrium) this equates to a temperature increase of 0.0031 °C. How did the convective flux get calculated? Why isn’t it higher? 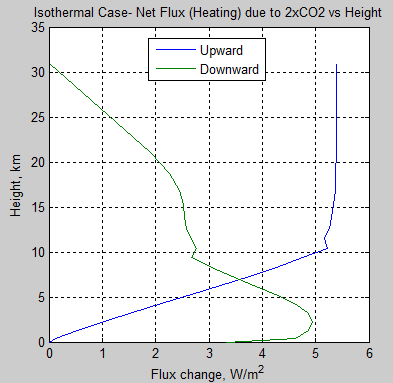 The model calculates all the radiative fluxes up and down through each layer, works out the absorbed energy and the resulting temperature increase. Then it checks between each layer to see if the lapse rate is exceeded (see Temperature Profile in the Atmosphere – The Lapse Rate). This means the atmosphere would be unstable, resulting in convection. The model then calculates the transfer of heat which would satisfy the lapse rate – the layer below loses X Joules, the layer above gains X Joules and new temperatures are calculated based on their respective heat capacities. This is what the model calculates and then adjusts temperatures, logs the convective heat moved and adjusts the energy change in each layer for that timestep. So convection in this particular instance isn’t any higher at the start simply because of the respective temperatures. Then the first atmospheric layer starts cooling via radiation (it loses more heat via radiation than it gains via solar heating) and this means that convection increases from the surface with each timestep – until a more steady condition is reached. Now a key point is that the surface imbalance changes over time – which we see in figure 3. Now there’s no magic “model driver” that makes this happen. It’s just basic heat transfer laws. The model just reflects, in a simplistic way, how heat is transferred between an ocean, an atmosphere and space. Now let’s look at the TOA balance – look back at figures 3 and 5. This is the balance for the whole climate. What might be interesting is to see that the climate is initially out of balance – losing heat. But why doesn’t the cooling of the climate mean that the imbalance just reduces until a steady state is reached? How is it possible for the climate to start heating at day 10 and peak somewhere around day 50 and then gradually reduce? This is very typical of complex dynamic scenarios. Readers familiar with dynamic heat transfer (and any kind of dynamic physics/chemistry/engineering problems) will have seen these kind of graphs before – overshoot, decay to equilibrium. What is completely unsurprising though is that the ocean and atmosphere end up in a steady state where cooling to space matches solar absorption – that is, the balance at TOA is ultimately zero. In the first few days the ocean and atmosphere are very much out of balance and so a big “reshuffle” of energy takes place where the ocean absorbs energy and the atmosphere loses energy until they are in much closer balance. 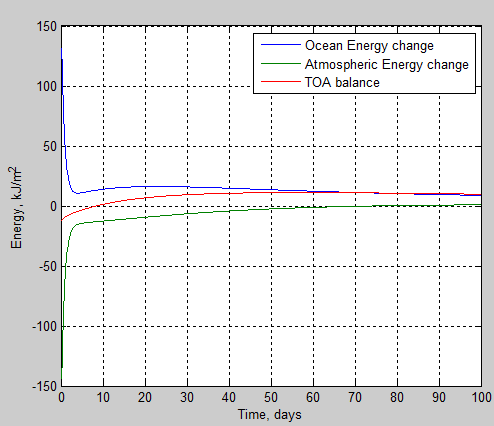 Then there is a gradual cooling of the system (primarily via ocean cooling) which eventually leads to an overall TOA balance – which can be seen in figure 2. In a subsequent article we will take this steady state condition, then increase the CO2 concentration and see what happens. We’ve seen via one specific example how heat transfer, via radiation and convection, lead to a new equilibrium condition. This can include some oscillation on the way to equilibrium. This particular case has no claim to be the “definitive median atmospheric condition”. It’s just a sample atmosphere that wasn’t in perfect balance for its conditions. Many people have conceptual models of how heat moves in the atmosphere and often these mental models are wrong. The purpose of this article is to illustrate how the basic heat transfer mechanisms work. As we can see with this simple example, it would be surprising to get the right answer about dynamic and final temperatures from some hand-waving arguments. If you have questions please ask. We can examine the energy transfer from many different perspectives. This update to the model has removed the constraint of keeping the stratosphere isothermal (see note 2). The stratosphere is not well modeled because the higher levels of the stratosphere are not included. These absorb most of the solar radiation via O2 & O3 and consequently keep the lower levels warmer than the equilibrium reached in this model. This model had 12 layers, with the TOA at 20 hPa (most previous models had 10 going up to 50 hPa) – the reason for going higher was just curiosity about the resulting temperature profile. Clearly the solar absorption in the atmosphere should be calculated via the absorption characteristics of the various molecules but this will take some work, and the current model is just an interesting starting point (or resting place depending on my interest level in this aspect of the model). 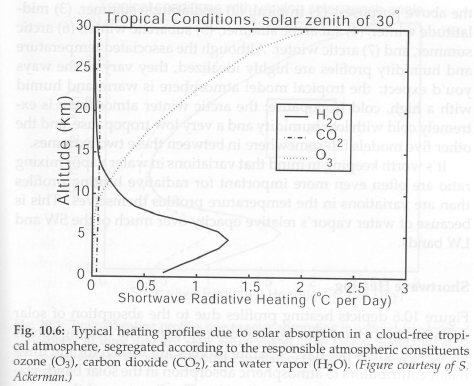 The main flaw in the current approach is that increasing water vapor in the lower atmosphere should increase heating via solar radiation but the model has a static absorption profile shown in figure 1. The main advantage is that it is a lot more accurate than having zero atmospheric absorption. The convective accounting is also a little challenging. The problem is first that to calculate a convective adjustment we can’t just change layer 2 temperature to make it layer 1 temperature + lapse rate x height. Because after we work that out we have to move the right amount of heat from layer 1 to layer 2 to make layer 2 heat up enough. This reduces layer 1 heat by an equal amount and reduces layer 1 temperature dependent on its heat capacity and the temperature difference is now incorrect. This first problem is easily solved with a formula (see note 3). Quick people unlike myself will immediately realize that we have not solved the problem at all because when we now consider layer 2- layer 3, the result will move layer 2 temperature and now layer 1-layer 2 is incorrect. A bigger simultaneous equation might do the trick, but I’m pretty sure that it would come unstuck without some careful thinking about layers where the actual lapse rate in a given time step is less than the prescribed lapse rate. A quick solution was to do multiple loops (iterate towards a solution) and check the lapse rates via a graph and some printing out. 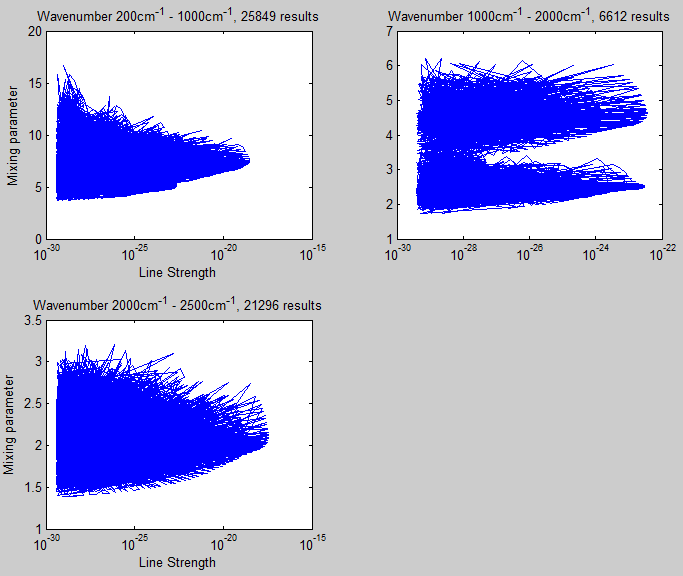 Matlab is truly the friend of the mathematically lazy. There are some checks and balances in my coding. 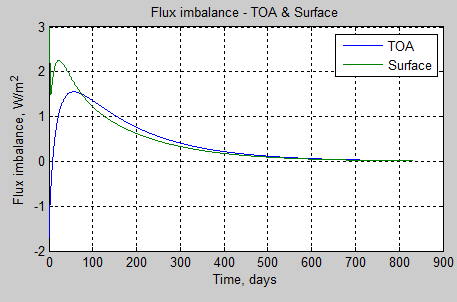 Each time step the model calculates the difference between the TOA balance and the energy absorbed in all layers of the model. This should be zero otherwise I have not implemented the first law of thermodynamics. In this model run the maximum absolute error in any time step was 3 nJ/m² – or less than 4 pW/m². This is just rounding errors in the maths. The model currently is tasked with printing an error message if ever more than 1J/m² goes missing in a time step. The Matlab function returns the temperature profiles vs time, energy changes vs time for each layer, convective energy vs time for each layer, along with surface balance, TOA balance and lots of other parameters. The energy vs time graphs in figure 2 are shown as W/m² so they can be related to other fluxes, but they are stored as Joules per m² – it’s just difficult to consider whether 1.67 x 105 J/m² is the kind of value we are expecting or not – and of course the (Joules) numbers change as the time step is adjusted. Note 1: The emission of thermal radiation by a surface at 288K with an emissivity of 1.0 is 390 W/m². This is across all wavelengths. 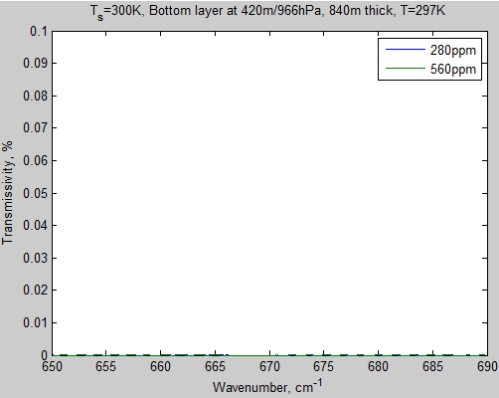 The model looks at the range of wavenumbers 200 – 2500 cm-1 (equates to 4-50 μm) to ease up the calculation effort required. Across this range the emission is 376 W/m². Note 2: This was partly to avoid what would look like confusing energy accounting, where solar absorption = the amount prescribed in the model + what we find necessary to keep the stratosphere isothermal. 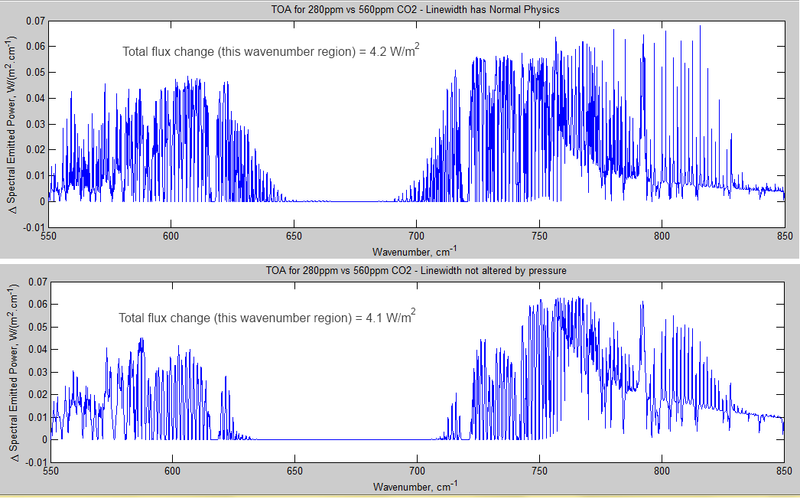 In Part Seven we looked at progressively wider wavelength ranges to see where doubling of CO2 had an impact. We also compared the top layer of the atmosphere (in that model) with the bottom layer – again seeing very significant differences. This series is aimed at helping people understand how “greenhouse” gases have the effect that they do. Now we have a model (described in Part Five) which incorporates the actual line by line absorption and emission of various GHGs in a realistic atmosphere we can play around with “what if” scenarios. Usually as we go up in altitude and pressure drops, the absorption lines get narrower. Around the tropopause the lines are almost 1/5 of their surface width. I introduced a new on/off parameter into the code which “turns off” this physics and allows us to keep the lines the same width as at the surface. Then compared 280 to 560 ppm of CO2 under one clear sky condition for the case with and without absorption line narrowing. The results surprised me. I expected that the effects of absorption lines narrowing would be more significant for this “increased GHG” scenario. The difference in outgoing radiation (OLR) across this band (which is most but not all of the CO2 effect) is only 0.1 W/m². The original article might give the false impression that the narrowing of lines has little effect on TOA flux. Actually it has a significant effect. 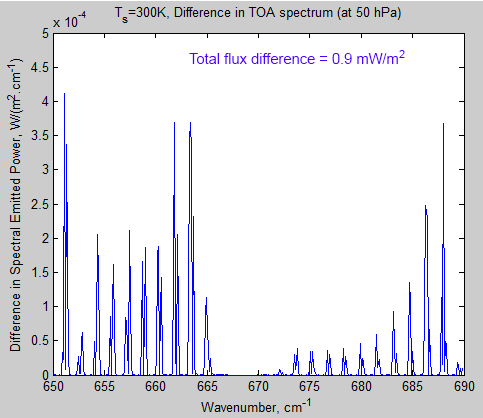 For example, for the case 280 ppm the difference in total TOA flux for correct – incorrect physics = 23.5 W/m². 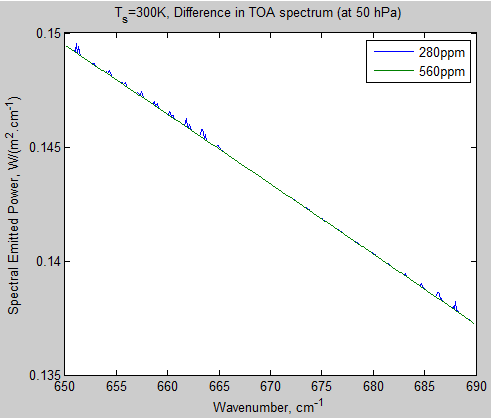 It’s just that for 560 ppm the difference in total TOA flux for correct – incorrect physics = 24.8 W/m². 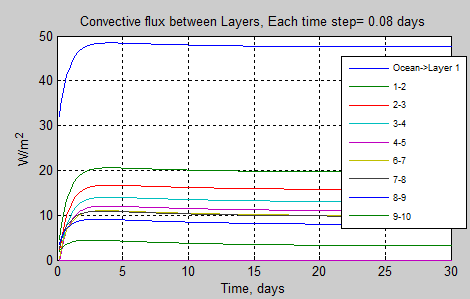 The values annotated on the graph are the flux for that wavenumber region only. TOA flux in the list below is across all wavelengths. 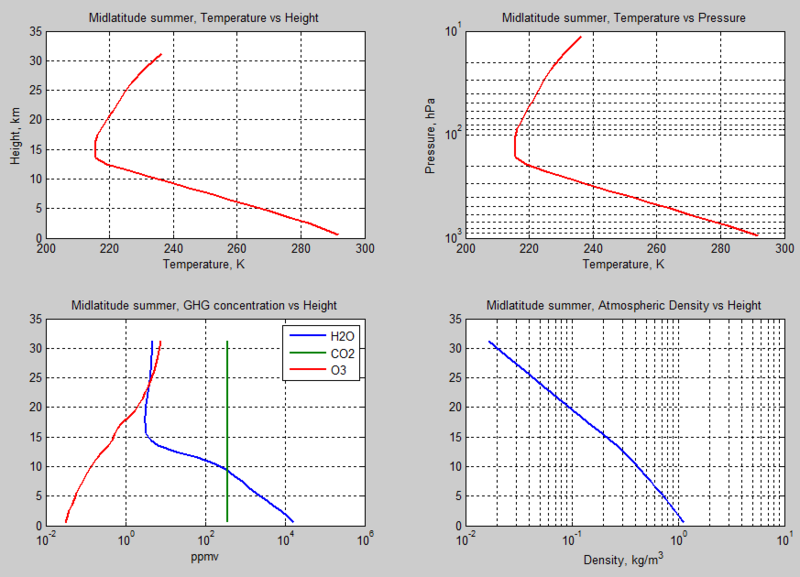 I created some simulations of different CO2 concentrations using the atmospheric radiation model described (briefly) in Part Two and in detail in Visualizing Atmospheric Radiation – Part Five – The Code. Wavenumber 667 cm-1 = 15 μm. 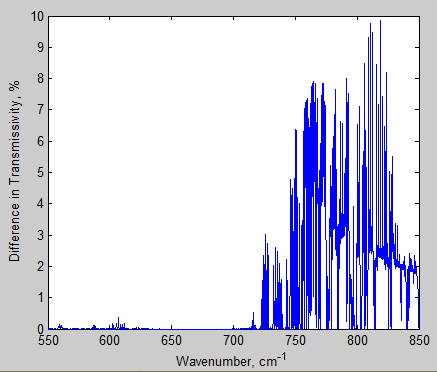 (Wavenumber in cm-1 = 10000/wavelength in μm). 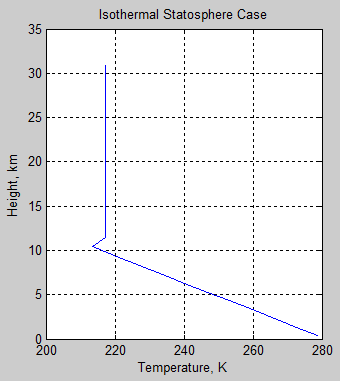 So we see that at 280 ppm a miniscule fraction of 666.6 cm-1 makes it through and at 560 ppm that’s gone to zero. But 0.05% down to 0% in just one small part of the spectrum is not much of an issue. The equivalent graph for the surface layer is just plain 0.00000% making it through. So it’s pretty clear that CO2 is already saturated and increasing CO2 has no effect.. well.. not in this 1 cm-1 range of the peak absorption of CO2. We can see that there’s quite a difference as a result of doubling CO2. Notice that the transmissivity scale has been dropped considerably from that of the top layer and still the transmissivity is zero – in both cases. So going from 280 ppm to 560 ppm has absolutely no effect on this layer. Before we move on.. how can a layer with a similar number of molecules have such different characteristics? The difference is the pressure. 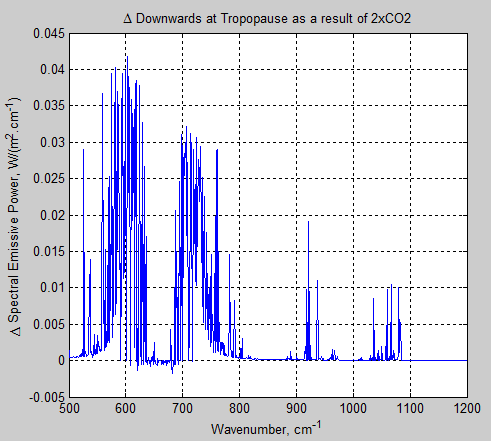 The line width of a typical CO2 absorption line is 0.07 cm-1 at the surface. At 100 hPa (17km) its line width will be about 0.008 cm-1(see note 1). The peak gets higher but the line gets thinner. Add lots of lines together at the surface and nothing gets through. Add lots of lines together at 100 hPa and quite a bit gets through. Wait a bit.. if we consider all the layers together don’t we get back to zero transmissity? Good point. (On a technical note we multiply transmissivities together, so if 10% gets through one layer and 5% through the next layer the total effect is only 0.5% getting through – and anything x 0 = 0). So that’s clear then. If we take the entire spectrum from 650 – 690 cm-1 (15.4 – 14.5 μm) and look at the surface emitted radiation, nothing gets through to the top of atmosphere (TOA) regardless of whether we are at pre-industrial levels of CO2 or the future potential doubled CO2. Why is there any radiation at all? Because the atmosphere emits radiation as well as absorbs radiation. If a gas molecule absorbs at one wavelength, it can also emit at that wavelength. See Part One and Part Two for the basics. So, even though the total transmissivity through the atmosphere at these wavenumbers is zero, there is emitted radiation at these wavenumbers. And, there appears to be some small change in TOA radiation. 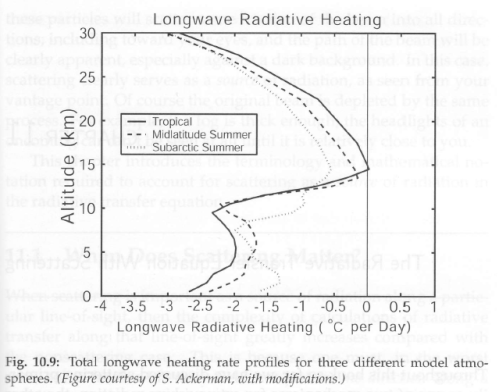 If you reduce outgoing terrestrial radiation (called outgoing longwave radiation or OLR) and still absorb the same amount of solar radiation then the climate must warm. Let’s look at the magnitude of this change – the calculation in the top right is the sum (the integral) of the curve. The change is less than 0.001 W/m²!! I knew it! 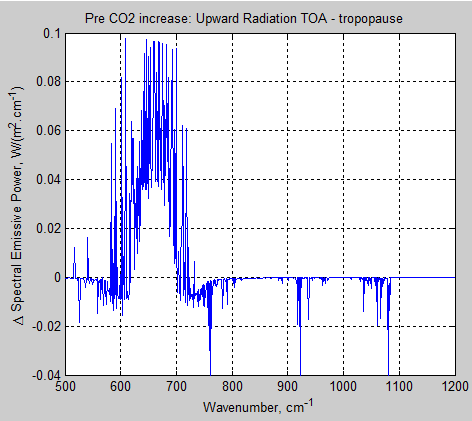 So doubling CO2 wil cause a tiny tiny reduction in outgoing radiation at TOA in this band (all other things being equal). Except it doesn’t look like much – and it’s not. If you have grasped why figure 5 is like it is even though total atmospheric transmissivity is zero then you have understood some important points. It’s worth clicking on the graph to expand the scale. 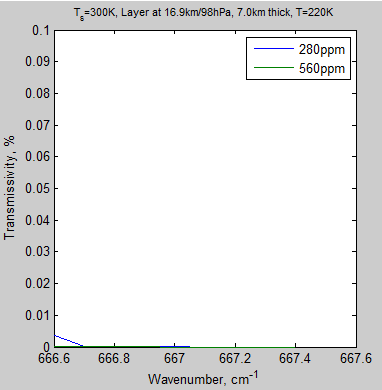 The mixing ratio of water vapor molecules in the surface layer is more than 100 times greater than the top layer we are considering (in this scenario). So water vapor absorption is considerable near the surface, and very small in the top layer. 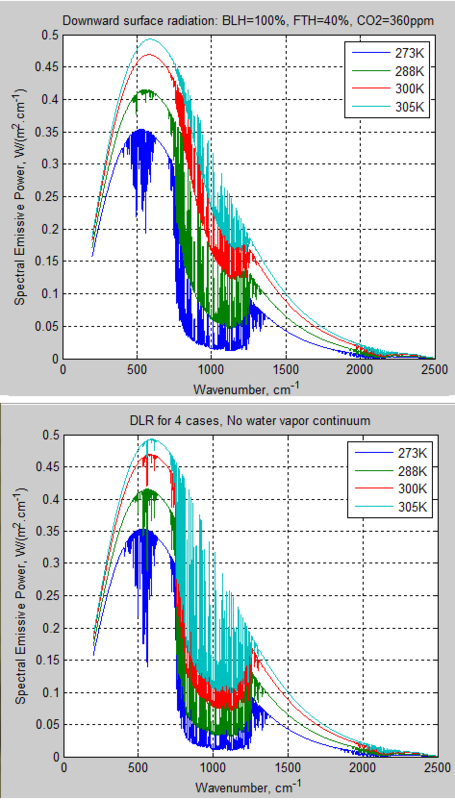 (I might do a simulation with zero water vapor to see what the water vapor impact is around 800 cm-1 – as the water vapor continuum may be playing a role here). As before, let’s consider total atmospheric transmissivity. From the graphs above of top and bottom layer of the atmosphere we might expect some wavenumber regions to be close to zero and others possibly not. Now let’s look at the TOA spectrum. The reason should be clear – the atmosphere emits radiation. The radiation that escapes to space is NOT surface radiation attentuated by the transmissivity of the whole atmosphere. It is a sum of radiation from the surface and from all different levels in the atmosphere, all very dependent on wavelength. In the wavelengths where the atmosphere absorbs strongly the emission to space is from higher levels. Take a look at Part Three – Average Height of Emission and Part Four – Water Vapor for more insight. 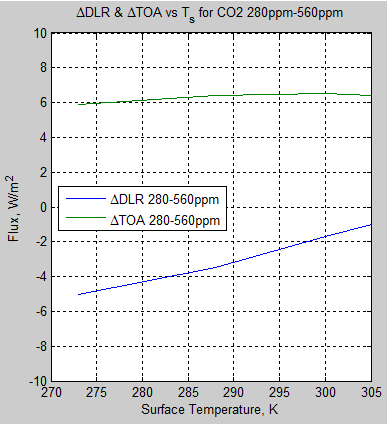 Here is the difference in TOA radiation for 280 ppm – 560 ppm. The total flux difference between the two cases in this wavelength region = 4.3 W/m². Simple considerations of transmissivity of radiation in the most absorbing wavelengths of CO2 have led many people in the blog world to conclude that increases in CO2 will have no impact on outgoing radiation and that CO2 is “already saturated”. Others have stated that water vapor totally overwhelms the effect of CO2. We can see that these both misunderstand the actual, more complex, situation. The data for the model comes from the HITRAN database (reference below) compiled over decades by spectroscopy professionals. The formula for absorption is the Beer-Lambert law. The formula for emission is the Planck emission law, modified by the emissivity at the wavelength in question. The formula for line width changes under atmospheric conditions have been known for 50 years or more and published in hundreds of papers. I created this model from scratch using these equations. The equations can be seen in the Matlab model in Part Five. The results look very similar to those published by atmospheric physicists who have run more detailed models under more exacting conditions – for example, the graph shown in CO2 – An Insignificant Trace Gas? – Part Eight – Saturation from Radiative forcing by well-mixed greenhouse gases: Estimates from climate models in the IPCC AR4, W.D. Collins et al, Journal of Geophysical Research (2006). Hopefully, the data presented here helps to verify the approximate magnitude of the net change in absorbed radiation due to CO2 doubling (see note 2). Much more important – the aim to to help the reader see more clearly how radiation interacts with the atmosphere under different conditions. Note 2: This is often known as radiative forcing. That term has some more restrictive conditions around it – primarily it is the case before any response from the lower atmosphere (i.e., the surface and atmospheric temperature are held constant) but after allowing for the stratosphere to return to radiative equilibrium, which takes a few months. 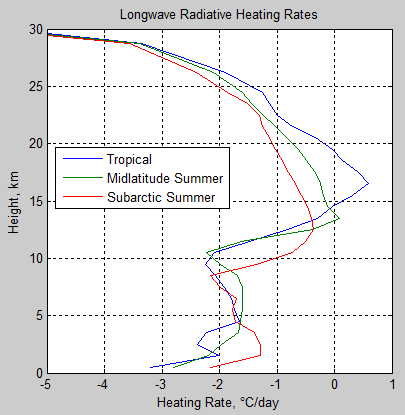 This Matlab model does not have a proper treatment of the stratosphere, and stratospheric radiation change does have an impact on the tropospheric radiation balance. The intent of this model is not to redo what atmospheric physicists have done, but to provide a reasonably realistic tropospheric model which allows us to look behind the scenes. This is a technical thread – not really “visualization” at all, just part of the series – looking for comment and verification. 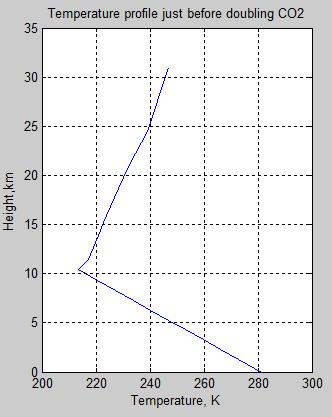 Interested people can read a little about line shapes in Atmospheric Radiation and the “Greenhouse” Effect Part Twelve – The Curve of Growth – and of course there’s no problems with questions, but I haven’t aimed to explain the subject in this article. I’ve been looking at the absorption line shapes in the upper troposphere/lower stratosphere. Lorenz line shapes (collisional broadening) dominate in the lower atmosphere, Doppler broadening dominates in the upper atmosphere – and in some middle ground there is a “convolution” which is a Voigt line shape. This is bit of a pig because instead of being a nice well-formed function (like Lorenz or Doppler), each point on each line shape is calculated by an integral from -∞ to ∞. That’s one absorption line requiring many many integrals of a complex function between -∞ to ∞. Here are a few pages explaining the topic from the excellent (very technical) Radiation & Climate, Vardavas & Taylor (2007). The key point is the value of the mixing parameter, a, that determines whether the line needs to be modeled as a Voigt profile at all. Note especially the last paragraph. If a > 1 for all lines of interest then we can use the simple Lorenz formula (pressure broadening). So after playing around comparing line shapes for a while I realized that in the region of the atmosphere that we have been getting to in this series so far, perhaps the Voigt line shape wouldn’t be needed. So let’s look at the likely values of a=bl0/γd. Also note that the formula for the Lorenz broadening (eqn 4.5) is an approximation, and the more accurate formula has an exponent which is measured (and can be retrieved from the HITRAN database) and here called nair. nair varies from 0.41-0.78 for the CO2 lines between 200-2500 cm-1, and, just for interest, the measured line width at 1013 hPa and 296K (here called bl0) ranges from 0.055 – 0.095 cm-1. a = C . bl0/v0 . pT0nair/Tnair+0.5. p0 = 1013 hPa and T0 = 296K are the pressure and temperature at which the HITRAN measurements are made. Note that the formula requires SI units so p0=101300. 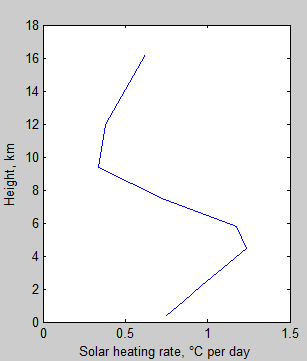 Just a note that the Matlab program seen in earlier articles in this series and described in Visualizing Atmospheric Radiation – Part Five – The Code uses gama for the line half width, nair for nair and v for v0. So now we can plug some values for the lower stratosphere into the equation, take the whole HITRAN CO2 database and plot line strength, S vs a. 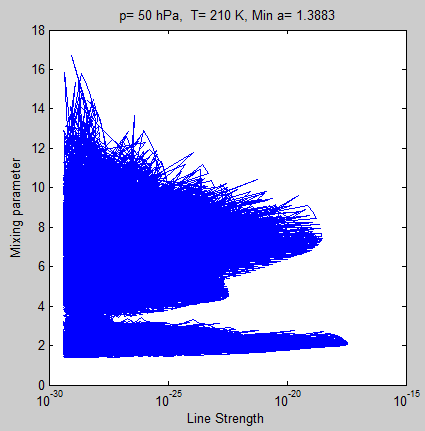 The reason for plotting line strength was expecting that there would be some values of a <1 and therefore requiring Voigt treatment and so wondering if they were so weak they could be ignored. Always want to skip the extra mile if possible.. The minimum value of the mixing parameter, a = 1.4. We are in the clear. Comments please – mistakes in the formula re-arrangement? I was also interested in the breakdown of the above results in relevant bands. It’s clear that the mixing parameter will be lower when v is highest, and the 2500 cm-1 region is of less concern anyway as the atmospheric radiation is comparatively very low at this point (4 μm). It does appear that the lines getting close to the Voigt threshold are those in the higher wavenumber (lower wavelength region, 4-5μm) that is anyway of less impact on the radiative balance in the atmosphere.